a. 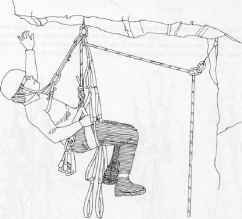 Some of the simplest forms of aid climbing are known as "Hang Dogging" or "French Free" in the civilian climbing community. Hang Dogging involves clipping into a piece of protection, having the belayer take in all the slack and locking the belay device off so the climber can rest. b. French Free involves using protection to pull up or to stand up on. The most basic method is using aid for one move. (1) Set in a piece of pro and clip an etrier into it. (2) Step into the etrier and slowly transfer weight onto it in order to test the solidity of the piece of pro. (3) If it holds, conduct a bounce test with one foot in the etrier. (4) Step up higher in the etrier and bypass the difficult move. (5) If the problem is lack of a handhold, a short web runner can be clipped into the pro and used as a handle. c. Aiding through multiple moves is more difficult and time consuming. (1) The first aid movement is to place pro as high as possible and clip in two linked carabiners. (2) Next, clip the daisy chain into the upper most carabiner of the pro just placed. All slack needs to be adjusted out of the daisy chain. Moving the carabiner down the daisy chain to the next clip in point does this, then slowly apply body weight to it. At this point you are hanging from the daisy chain, if you can reach up to the pro, your adjustment is correct. (3) Now conduct a hanging bounce test. This is to ensure that the piece is solid prior to committing to it. (4) If the piece is solid, clip the etrier to it, upper most carabiner, and ascend the etrier. (5) Once your waist is level with the piece of pro, clip in the fifi hook to the upper most carabiner, sit back and rest. By clipping everything into the uppermost carabiner, the lower carabiner is free for the rope. (6) Now, clip the rope, into the lower, or free carabiner on the pro that you are hanging from. 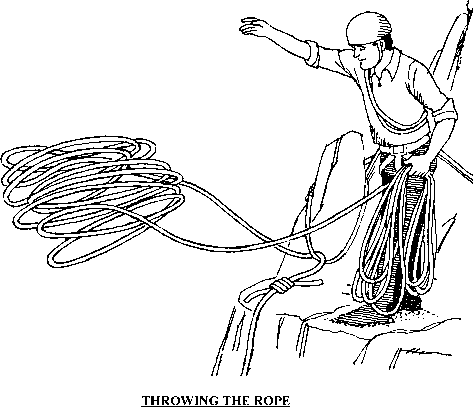 Note, if you clip the rope into the pro at an arms length, like when free climbing, you then ascend the etrier and the piece blows, you just increased the length of your fall. (7) The sequence begins again; however, now that you are off the ground and hanging from the fifi hook, you place the pro, two carabiners, daisy chain and test. If the new piece blows, you should only fall a couple inches until your fifi hook on the previous piece stops you. For this reason, only unclip your fifi hook after the bounce test and just before ascending the etrier. NOTE: Increased stability on a climb can be provided by using two etriers with a Daisy Chain attached to each however this requires drawing the extra equipment in advance. d. Due to the extreme amount of time involved in direct aid, the leader, once at the belay, should fix the rope to the anchor. 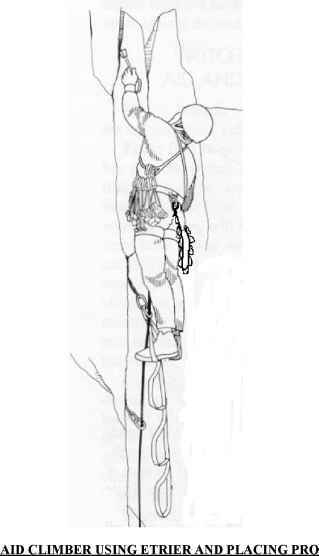 The #2 climber should ascend the rope by use of mechanical ascenders, cleaning the pro while on a rope ascender. If the climbers do not have a set of rope ascenders, then it will be necessary for the #2 climber to aid the pitch and clean as he goes while being top roped. The only difference being, once the fifi hook has been released from the last piece of pro, the climber will hang from the daisy chain, or clip in the fifi hook to one of the steps of the etrier, hang and remove the previous piece of pro. TRANSITION: Knowing the proper sequence and performing it correctly is critical. Are there any questions over techniques or the sequence? What is a daisy chain used for in climbing?